"My family says I am famous for my rolls. I hope you like them too." Place the bread flour, buttermilk, brown sugar, salt, yeast, and egg yolk into a bread machine. Using the Dough setting, allow the machine to mix the ingredients until moist. Pause the cycle and pour in the oil, then let the machine continue to the end of the Dough cycle. Grease muffin pans or a baking sheet, and set aside. Punch down the dough, and remove it from the machine. Divide the dough into 12 equal parts, form into round, smooth rolls, and place them into the cups of the muffin pans or on baking sheet, making sure the rolls don't touch each other. Cover the rolls with a kitchen towel, and let rise in a warm place until double, about 25 minutes. While the rolls are rising, preheat oven to 350 degrees F (175 degrees C). Bake the rolls in the preheated oven for 20 minutes, or until golden brown. 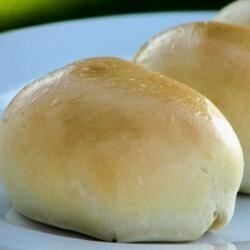 Rub the tops of the hot rolls with a stick of butter for a soft crust, cool the rolls slightly, and serve warm. I replaced 1 cup of flour with whole wheat, used only one tablespoon of (white) sugar, and used a whole egg. This made eight of the best hamburger buns I've ever eaten. Highly recommended!